The winning solution to the #DDART challenge has been announced: The Displacement Downtown, by Brendan Lim. This solution aims to help the viewer relate to people internally displaced within the borders of their home countries by violence or disasters. Press release. Develop a form of digital art to illustrate/depict the phenomenon of internal displacement – to mark the 20th anniversary of the Guiding Principles on Internal Displacement & IDMC. The winning solution will be invited to undertake a paid one month residency with IDMC – the prize will be 5,000 CHF for the residency plus flights. 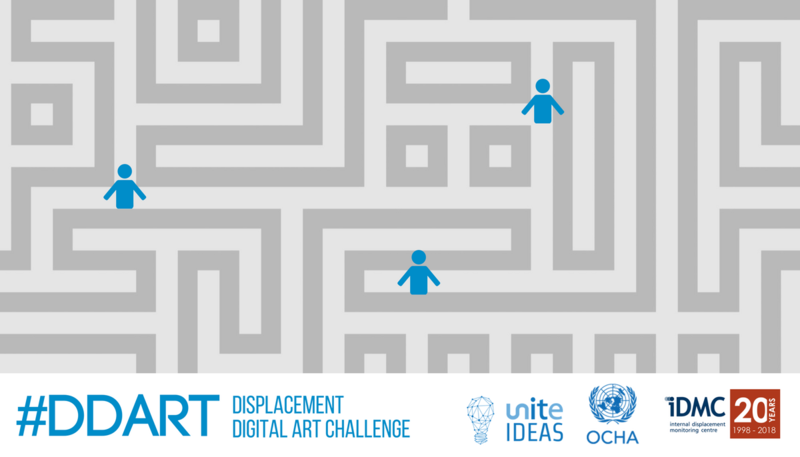 We challenge you to develop a form of digital art to capture the essence of internal displacement. Illustrating the nature of the movement and the challenges facing IDPs. We want to show what it is like to become internally displaced, and the specific challenges unique to internal displacement. Putting the reader in the shoes of an IDP. Showing the choices they have to make, the subsequent consequences. Show the confusion they experience – what are my rights, what am I entitled to? And link this to the internal displacement guiding principles. The 20th anniversary of the Guiding Principles which is celebrated in 2018, constitutes a unique opportunity to raise awareness of the phenomenon of internal displacement. Read more at http://www.internal-displacement.org/. Millions of people are forced to flee their homes or places of habitual residence each year, including in the context of conflict, violence, development projects, disasters and climate change, and remain displaced within their countries of residence. Millions more live in situations of protracted displacement or face chronic displacement risk. As of the end of 2016, 40.3 million people were living in internal displacement because of conflict and violence. This is a crisis of enormous proportion and yet, the world is largely unaware. There are twice as many IDPs worldwide than there are refugees, however the issue remains underreported and awareness is low. In addition, internal displacement can spill over into cross border movement, whether it be as a refugee or migrant, so it is key that the entire trajectory and implications of displacement are understood across the spectrum. Though women and children often make up the majority of the internally displaced, their particular protection, assistance and reintegration or relocation needs are often overlooked or not addressed with priority. National authorities are responsible for ensuring the specific concerns of groups including women heads of household, unaccompanied minors, persons with disabilities, and the elderly, are taken into account and addressed. Marginalised groups are disproportionately affected and often experience discrimination, including minority ethnic groups, indigenous populations, the rural poor and informal settlers in urban areas. The Guiding Principles on Internal Displacement (published by the UN in 1998) sets out the rights of internally displaced persons (IDPs) and the obligations of governments towards them in accordance with international law. The document emphasises the primary responsibility of national authorities for protecting and assisting all IDPs, regardless of the cause of their displacement. These principles underlie IDMC’s monitoring and analysis of situations worldwide. Internally displaced persons (IDPs) are "Persons or groups of persons who have been forced or obliged to flee or to leave their homes or places of habitual residence, in particular as a result of or in order to avoid the effects of armed conflict, situations of generalized violence, violations of human rights or natural or human-made disasters, and who have not crossed an internationally recognized State border” (Guiding Principles on Internal Displacement, 1998). • The involuntary character of the movement. • The fact that such movement takes place within national borders. IDPs are entitled to enjoy the same rights and freedoms under international and national laws as do other people in their country. Some of the typical needs and protection risks that arise in internal displacement include family separation, loss of documentation, freedom of movement in and out of camps, loss of property, and further exposure to the risk of secondary or onward displacement. Achieving a durable solution to internal displacement means that IDPs no longer have any specific assistance and protection needs that are directly linked to their displacement and can enjoy their human rights without discrimination on account of their displacement. Throughout all phases below, teams are encouraged to interact with the core team at the challenger organizations to discuss the requirements for this project. July, 31, 2018: Last day to submit your working solution. August 21: End of the review phase. By the end of this challenge, we will have one or more self-organized teams developing versions of this app. This or these teams will continue to collaborate in an open source manner towards the full completion, testing and rollout of the app. All the inputs and outputs of this project must be covered by recognized open source and creative commons licensing. You will be asked to accept terms and conditions prior to submitting any content. It is encouraged that teams leverage and extend existing open source frameworks. Mr. Jorge Martinez Navarrete, United Nations OICT, Innovation Unit. Contact them by creating your account on Unite Ideas. No Ideas have been selected.